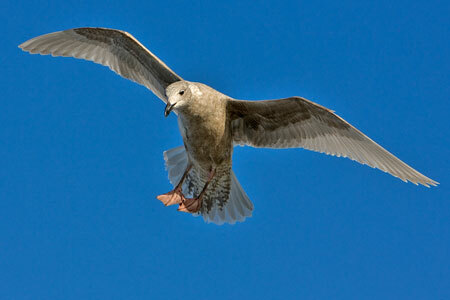 Description: The Western Gull is a large gull with a white head, neck and underparts. The back is dark slate gray. The tail feathers are black with a row of white spots. The legs and webbed feet are pink. The beak is yellow with a red spot on the lower mandible (see photo). Both sexes have the same type of plumage, but the male is larger than the female. Calls: The call is a loud whistly "keow". 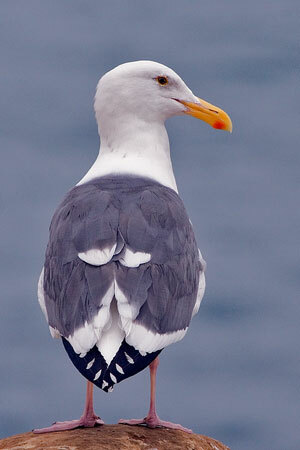 Range / Habitat: A native of the Pacific Coast, the Western Gull is seldom found far from the ocean. Breeds on offshore islands along Pacific Coast from southern Washington to central Baja California. The Western Gull is common along the outer Washington Coast from Cape Flattery south to Oregon. Nesting on rocky cliffs and islets all along this region, and foraging in marine coastal areas and urban areas adjacent to the coast. Large colonies are known to occur in Grays Harbor, Willapa Bay, and at the mouth of the Columbia river. Click the range map to learn more about the distribution of Western Gulls in Washington. 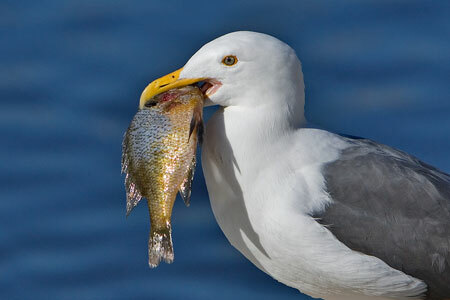 Diet: Western gulls feed on marine invertebrates and fishes. They also eat eggs and chicks of seabirds. Like other gulls, they scavenge carrion and refuse. Forages at sea, in intertidal areas, along beaches, and at dumps. Nesting: They nest in colonies, on islands or offshore rocks, often with other gull species. The nest is a scrape in the ground filled with vegetation, feathers, rope, plastic, or other items. A cluch is has 1 to 3 eggs. The male and female take turns incubating the eggs for about one month. The young are covered in cryptically colored down so they are not easy to spot. The young may leave the nest a few days after hatching, but they won't go far, often hiding in nearby vegetation. At 6 to 7 weeks of age, they begin to fly. The young become independent from the parents and leave the colony when they are 10 weeks or older. Behavior: Captures food near the surface of water or on shore. Steals food from cormorants and other gulls. Swallows large prey whole. Will steal milk from lactating female seals while they lie on their backs sleeping on the beach. Western Gulls frequently hybridize with Glaucous-winged Gulls and often display intermediate plumage characteristics, leading to identification confusion between these and other large gulls. Western Gulls congregate in large numbers along the coast. The Western Gull will steal unguarded eggs or chicks of other species. Western Gulls are common in all seasons along the Washington coast.